The French press is reporting that one of the country's small car manufacturers has unveiled the Exagon Furtive eGT. 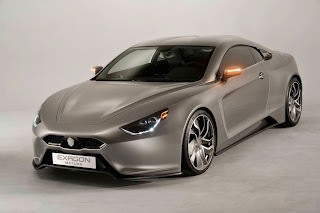 Exagon Motors has presented the Furtive eGT, a new electric sportscar, to a small group of journalists. Apparently, the Exagon Furtive eGT is powered by two 125 kw (170 hp) motors produced by Siemens for a total of 250 kw (340 hp) and has a range of up to 400 km. When the juice from the batteries runs out, the Exagon Furtive eGT has a small gasoline range extender engine that can take it up to an additional 400 km/h, for a total range of up to 800 km. The Exagon Furtive eGT has a 2+2 seating configuration and will be premiered at the Paris Auto show this week. Some sources say the Exagon Furtive eGT has a top speed of 250 km/h and that it has supercar acceleration - the 0 to 100 km/h sprint takes 3.5 seconds. Exagon Engineering are the company behind many of the ice racing machines that contested the Trophée Andros Electrique last season. Furtive eGT looks very nice, having 400km electric drive on charge and up to another 400km on gasoline is sounds good, this may be one of the biggest competitor for the Tesla motors Roadster.